I've fallen down on my plan to continue my weekday workouts. Three weeks of testing alternative running machines made it easy to stay on schedule. I did those sessions at the end of my work days and left the office immediately afterwards. I did surprisingly well with those afternoon workouts and they really energized me for my long drive home. I'd done no workouts since Sunday's Runsketeer run at Bethpage so I went out this morning for a loop around the neighborhood. The weather was surprisingly cool - not even 60° - so I put on a fluorescent orange long sleeve running shirt and shorts. 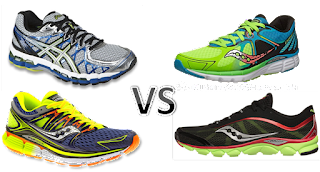 I wore my Saucony Triumphs to compare my last experience with the Kayanos. 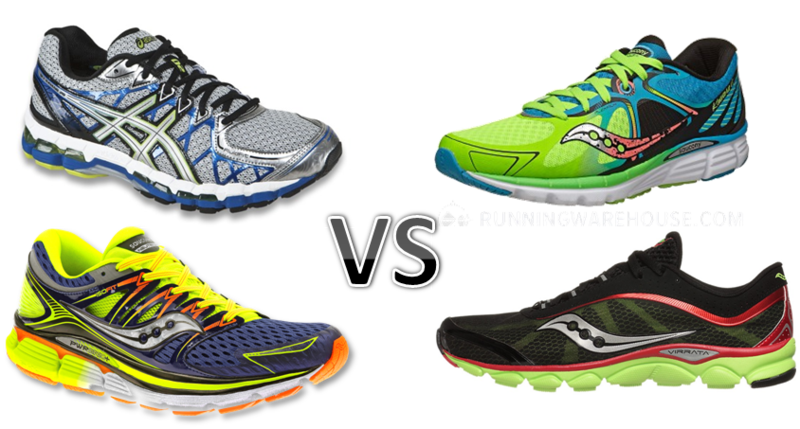 I like both pairs, but I'm still preferring the lower, more minimal design of the Kinvaras and Virratas. SIOR, who is switching to ultra cushioned Hokas, pointed out that my flat arches better match low drop running shoes while higher arched runners like her prefer a wider variance between forefoot and heel heights. I feel it's wasteful to invest in new Kinvaras while I have two pair of almost-new high end trainers, but I'm going to run in my well-used Virratas this weekend to see if I do better in them. My disc issue is almost completely gone, although I still have a slight flexibility issue in my left hamstring. That's causing me to land off-center on that side, resulting in slight mashing of my foot near the front. I'll be curious to see if that condition appears with the low platform Virratas. My run this morning went fine, although I did feel some aerobic challenge throughout the run. It's hard to believe it was just a year ago that I managed through the Brooklyn Half. I have a long way to go to get to my 10K base. It's a three day weekend and that will provide time to string together three more runs. I really need to get out of the 3-4 mile rut and start edging closer to five or more. My orthopedist discouraged trail running while recovering from my disc injury, but I may be ready for a return to Stillwell at this point. I'll be happy if this cool weather continues on Saturday. I want to enjoy the spring as long as I can. I can see that you know your running shoes. Very happy with my new Hokas, mainly because I am now 5'6". I'm glad you took the scientific approach to selecting them. More importantly, are they pretty? No, Im not crazy about the color.